There is nothing better than hearing good new music for the first time. It doesn't matter what it is or how you hear it, when you instantly connect with a new artist, even though they created the music, it becomes yours. The Black Angels recently caught my attention. I think it was on Austin City Limits, or maybe KEXP's YouTube Channel. They have this echoy psychedelic awesomeness going on that hits me in just the right way. 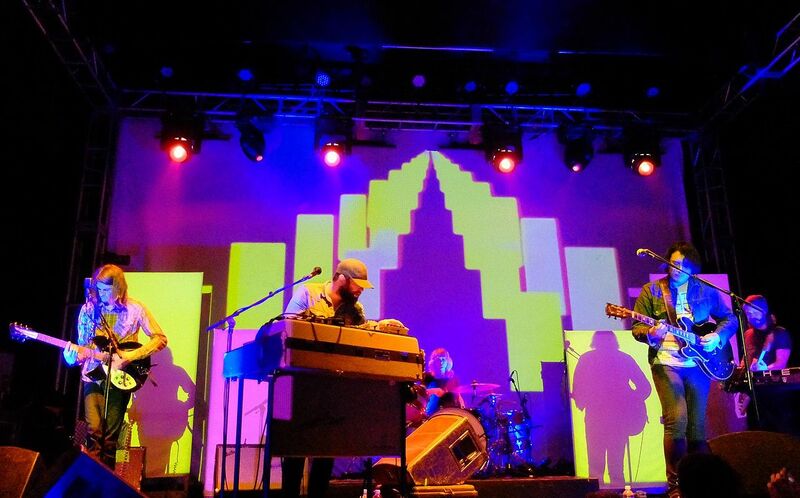 The Black Angels. Photo by Gina Pina from Austin, TX. Courtesy of Wikipedia. Whatever the music happens to be, when it's the right thing for me at that moment, when the notes catch my ears, something unlocks within me. It's like when I am jamming and I find a groove and ride it for as long as I feel it. For certain songs by certain artists, I get that feeling back every time I hear them. Like anything by Donovan or The Kinks or Tommy James and the Shondells. I could listen to their albums on repeat for a month and be ready to re-up the next month going. Variety is good, too. Like most music lovers I know, I go through phases. 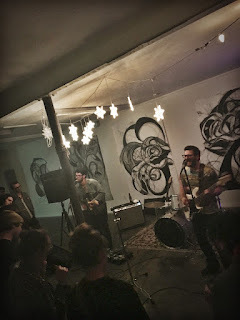 Lately, there has been this local band, The Dreemers, who my wife, a couple of our closest friends, and I happened to catch at Pork Rokr last summer. It took the band a while to set up (which I image is a bit of a challenge to do on a front porch), so there was this sort of slow-building of suspense. We had not heard of them before, but when we saw them listed on the map of performances around our Highland Square neighborhood, something about them drew us in that direction. We had seen some good performances that day by a variety of bands, and even though we did not know exactly what to expect, we had high hopes. The band of high school kids who had just performed on the porch next door had just finished a respectable "Smells Like Teen Spirit," and we sat on curb, the sun bleating down high overhead. We waited patiently, discussing how my friends and I should start a folk rock band called Peters, Charles, and Peters. I would be Pete Peters, Adam would be Charles Charles, and Josh would be Charles Peters. As soon as The Dreemers started playing, the four of us were hooked. They have this twangy surf-rock, Talking-Heads-meets-The-Akron-Sound vibe going. We talked about them for a while after that, and last night, we, minus Josh, went to see them perform again, this time at this cool little art collective gallery space called Hive Mind. Two other Akron-area bands, Hard in the Pink and Birthday Noose, also performed. The Dreemers at Hive Mind on 4/16/16. Photo by Sarah Gott. It was an all-around great concert in a very intimate and low-key setting. The three of us had a great time, and everyone else there seemed to be enjoying the music, as well. We will definitely be going again. One of the reasons we went last night, in addition to our love of the band and music and going to shows, in general, is because I will be reviewing The Dreemers upcoming EP, "Is, Is," for The Devil Strip's May issue, and I had to remind myself what I will be in store for when I sit down to listen to it. The EP comes out on May 13, when the band will also have a release party at Jilly's Music Room. I have this feeling that this is going to be a great summer with a lot of amazing new music to experience and share. I can't wait!